Natalie Morningstar, a junior majoring in Computer Engineering, has been awarded a Charlotte Newcombe Foundation Scholarship. The Charlotte W. Newcombe Foundation is an independent foundation begun in 1979 by the estate of Mrs. Newcombe, a Philadelphia philanthropist. 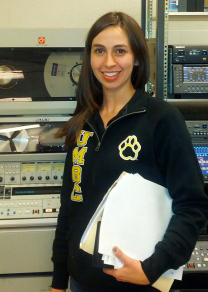 Since 1981, the Foundation has provided scholarship funding for mature women students at UMBC. This fall, Natalie will participate in the “Returning Women Mentor Program,” which is a peer mentoring initiative that the Women’s Center at UMBC is introducing to better facilitate productive and ongoing connections among the scholars in their programs. Natalie is also a CWIT Affiliate and part of the first cohort of Transfer Scholars in IT and Engineering (T-SITE). T-SITE is funded by an NSF-funded S-STEM grant and will serve 30 transfer students as part of the larger CWIT Scholar and Affiliates community through 2017. This post originally appeared on the CSEE news blog.